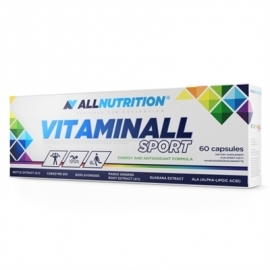 > CATEGORIES>Vitamins>VITAMINALL SPORT - 60 CAP. 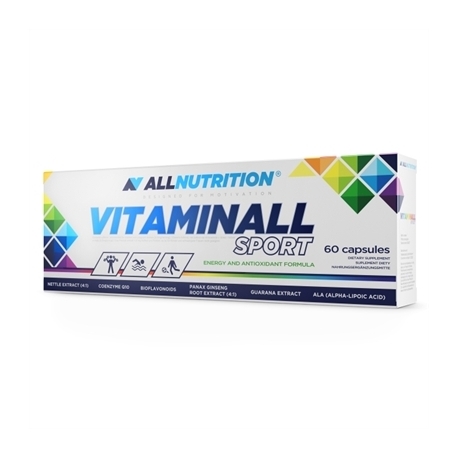 VITAMINALL SPORT - 60 CAP. including for physically active people and sports people. Ingredients: capsule with vitamins (navy): vitamin C (L-ascorbic acid), capsule shell: gelatin, bitter orange extract (Citrus aurantium) standardized for 90% bioflavonoids, extract (4: 1) from nettle (Urtica dioica) , Green Herb Leaf Extract (Camellia sinensis) standardized to 40% epigallocatechin gallate (EGCG) and max. 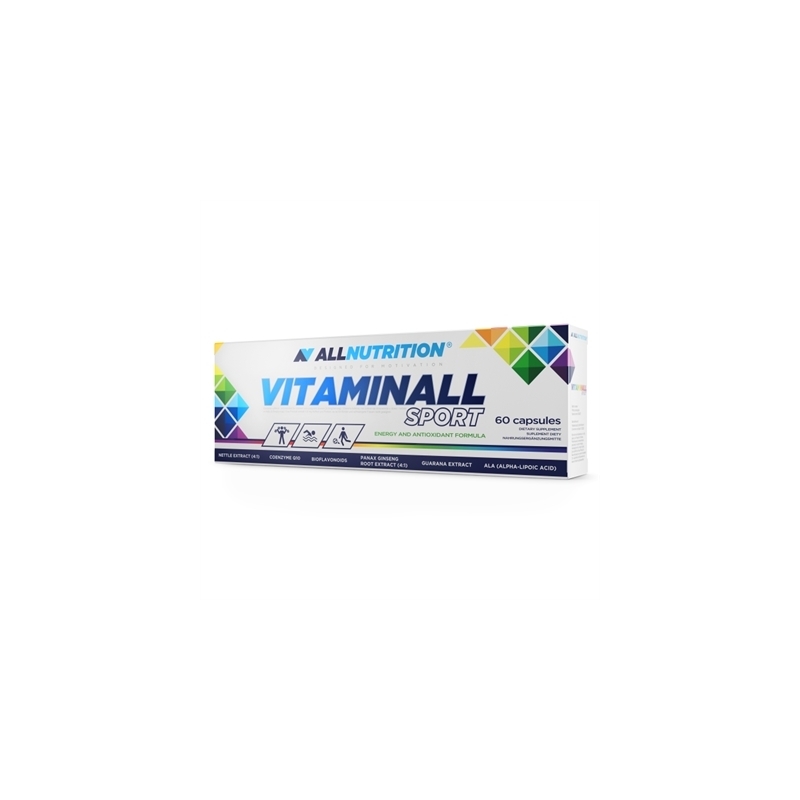 5% caffeine, vitamin E (DL-alpha-tocopheryl acetate), niacin (nicotinamide), vitamin B1 (thiamine hydrochloride), vitamin B2 (riboflavin), vitamin B6 (pyridoxine hydrochloride), vitamin B12 (cyanocobalamin), extract from guarana (Paulinia cupana) standardized to 10% caffeine, extract (4: 1) from ginseng root (Panax ginseng), anti-caking agent - magnesium salts of fatty acids, pantothenic acid (calcium D-pantothenate), alpha-lipoic acid ( ALA), coenzyme Q10, vitamin A (retinyl acetate), vitamin D (cholecalciferol), dye - titanium dioxide, folic acid (pteroylmonoglutamic acid), biotin (D-biotin), dye - brilliant black, pigment - patent blue V, dye - azorubine. capsule with minerals (white): calcium (calcium carbonate), magnesium (magnesium oxide, magnesium diglycinate), capsule shell: gelatin, iron (iron gluconate), manganese (manganese gluconate), zinc (zinc gluconate, zinc oxide), anti-caking agent - magnesium salts of fatty acids, copper (copper gluconate), dye - dioxide.